HA! After Rih followed me I gave her a very long nickname. Excuse the title. Anyways, with Chris' most recent girlfriend Karrueche having stated over twitter that she's over their relationship, it looks like Chris is single & free to hang out more openly with his first love Rihanna. The two were spotted by fans once again last night in 1Oak a popular NY club as they were the night before. Chris free ran to NY this past weekend..and was even seen in the above photo tip toeing out of Rih's hotel yesterday evening. Though some blogs are suggesting that Chris & Karrueche are "going strong", photos and tweets are vividly proving otherwise. Im not sure why people are saying he's cheating while hanging with Rih the last few nights.. for all we know he & Karrueche could have broken up. 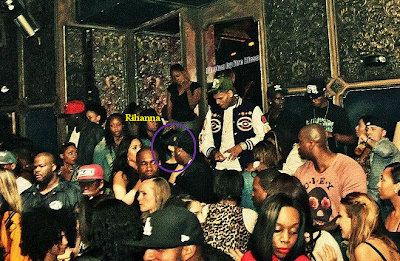 On lookers in the club Tuesday night gushed about how much affection Chris & Rihanna were showing one another. Reports say he jumped over into her VIP section with her and friends. Though Chris & Rihanna have remained mum about this on social media sites, their excited fans havent. They make sure to tweet every encounter with the publicly reunited friends. OF course this reunion is not exciting to many, but it looks like Chris & Rih have lots of positivity coming their way about their decision to reconnect in whatever way. There are a few people who believe people can grow up a lot between 19 & 24... Chrianna has become the most talked about non couple of all time, but as of late have found less and less reason to care about public opinion. I wouldn't jump to any conclusions either way just yet. Sure they're gonna just hang out a bit before any titles are given- which is smart. Again, I personally wish all involved a happy & fulfilled life, I dont care much beyond that. If these two are finding their way healthier, more matured, and patient back to each other against all odds- let it be beautiful. I agree. They were so young, no way it's fair to label them for the rest of their lives. U have no idea how linking that video at the end just made it so profoundly clear to me! I get what he was doing in the video! Risking everything for the people(person) he loves. I was not for them being back together because I read all of the statistics and what not, but I think Im having a change of heart. I surely wouldn't want to be labeled from the things I did as a young adult. I wish them well.